Hope Ranch is only a 5-minute drive west of Santa Barbara. It features an upscale residential area and is known for the luxurious properties and estates set on its oak-covered hills. The pleasant Mediterranean climate and private local beaches make local residences feel like vacation getaways. Its history goes back 6,000 - 10,000 years, when archaeological evidence points to the first Native Americans in the area. It wasn't until the late 1700's that white settlers came to the area, which soon became part of the Mission Lands. It was Thomas Hope, who arrived in the mid-1800's as a Government Agent to facilitate relations with the Native Americans, from whom the area received its name. 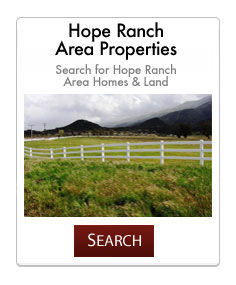 Today, Hope Ranch is comprised of approximately 686 residences on more than 1,800 acres. From its bluff-top drives you'll be treated to stunning views out over the Pacific Ocean and Channel Islands. In town, you'll see palm trees lining Las Palmas Drive, planted around the turn-of-the-century. And around town, you'll find a polo field and soccer fields, baseball diamonds, and tennis courts. For horseback riders, there are over 20 miles of riding trails, which connect to the beach. In the summer, riders can also use the beach from the park toward Goleta. In winter, you can use the entire beach. Because of the local interest in horsemanship here, there is a strong Riding Trails Association in the Hope Ranch area. Located nearby are the Earl Warren Showgrounds, known around the region as one of the finest arenas for showing horses. Other community associations and amenities include the Hope Ranch Patrol, the Hope Ranch Garden Club, the Hope Ranch Park Homeowners Association, and, of course, the ever-popular private and public schools. The private La Cumbre Golf and Country Club features the beautiful, landscaped Laguna Blanca lagoon.